Metoclopramide's remaining virtues appeared limited to speeding gastric emptying5 and it's incredibly low cost – in many health systems cheaper in fact than an ampoule of saline. Kranke, Apfel and team were the first to highlight that a large body of research contributed by a single researcher and institution could significantly shift the findings of a meta-analysis.6 The dominant institution that worried Kranke et al. was Toride Kyodo General Hospital in Japan – and the researcher was Yoshitaka Fujii. Fast forward eleven years, and while the Fujii fraud is now well known (see "Fujii, anesthesia and research fraud") the impact of Fujii's research on assumed anesthesia truths is still emerging. The impotence of metoclopramide is the first accepted truth to be revisited. De Oliveira and team performed a systematic review of 30 studies and over 3000 patients examining metoclopramide 10 mg, specifically excluding those with "questioned validity" from Fujii.7 They showed metoclopramide to be significantly better than previously thought, effective in reducing both the incidence of PONV, and even nausea and vomiting when examined individually. Metoclopramide reduced the incidence of 24 h PONV compared with control, odds ratio (OR) [95% confidence interval (CI)] of 0.58 (0.43-0.78), number needed to treat (NNT)=7.8. When evaluated as separate outcomes, metoclopramide also decreased the incidence of nausea over 24 h, OR (95% CI) of 0.51 (0.38-0.68), NNT=7.1, and vomiting over 24 h, OR (95% CI) of 0.51 (0.40-0.66), NNT=8.3. De Oliveira demonstrated a significant effect in preventing early PONV (NNT 7.6) – in particular for preventing nausea alone (NNT 5.9) – though less effect in preventing early vomiting (NNT 10.5). While these results still fall a little short of the performance of 5HT3-antagonists (ondansetron reportedly has a NNT=6 for nausea prophylaxis and NNT=7 for vomiting) the small difference in efficacy may be made up for by the dramatic lesser cost.8 De Oliveria's results for metoclopramide compare favourably with 8-10 mg of dexamethasone, having a reported NNT of 7.1 but a terribly wide confidence interval (95% CI 4.5-18). As with all meta analyses, conclusions must be tempered with an appreciation of the limitations when grouping different studies together. 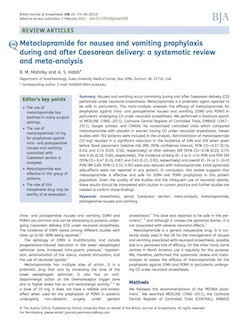 Although this review includes studies involving a range of different surgeries the authors show a low measured heterogeneity in the results – giving us some confidence in the generalizability of metoclopramide prophylaxis to different types of surgery and anesthesia techniques. 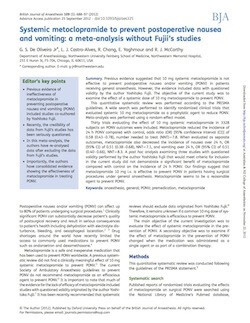 John Carsisle followed up his impressive exposure of the Fujii fraud10 with a lap of honor quantifying the differences between Fujii's anti-emetic research and results from other authors. "if we exclude the data of Fujii et al. – Granisetron remains more effective than metoclopramide for all four outcomes, with significant differences vs droperidol persisting for two outcomes (vomiting, rescue) but disappearing for nausea and the combined "nausea and vomiting" outcomes. Against placebo, the effects of granisetron and ramosetron are less – Postoperative nausea and vomiting after granisetron triggers rescue antiemesis at the same rate as droperidol and metoclopramide, instead of less often. The unique characteristic of granisetron to act synergistically with other antiemetics disappears." If we take a few steps closer in the "metoclopramide question" a specific surgical procedure offers further insight: cesarean section under regional anesthesia. This group of patients suffers both a high incidence of PONV and uniquely also a high incidence of intra-operative nausea and vomiting (IONV). They showed 10 mg of metoclopramide to be effective at reducing intra-operative nausea and vomiting whether given before block placement or after delivery – although the effect was greater if metoclopramide was given before the block (RR 0.27 vs 0.38, & 0.14 vs 0.34 for ION and IOV respectively)14 Metoclopramide was also associated with a lower incidence of early PONV (0-3 h) and PONV over all (0-24 h & 3-24 h). Reassuringly, extra-pyramidal reactions were not reported in any of the 11 studies totally 702 patients. Though we need to bear in mind that there was a lot of heterogeneity between the included studies: spinal (9 studies) vs epidural (2); before block (4) or after delivery (7) timing; and most notably presence (4) or absence (7) of neuraxial opioids. This diversity resulted from the inclusion of many older studies – unfortunately metoclopramide has not been an exciting research topic for some time! Additionally, two studies from Fujii were unfortunately included in the analysis,15 both investigating anti-emetics given after delivery while under spinal anesthesia. Though sub-groups that did not include these studies (pre-block metoclopramide) showed even greater beneficial effect for metoclopramide than the sub-group (metoclopramide after delivery) that did include them. Finally, the effectiveness of metoclopramide for IONV and PONV prophylaxis during cesarean sections was borne out by a recent Cochrane review from Griffiths et al.18 While the reviewers noted the superiority of 5HT3-antagonists, the efficacy of metoclopramide for IONV prophylaxis was again demonstrated. Importantly Fujii's studies were not included in this analysis. An old drug with old tricks? Modern 5HT3-antagonist anti-emetics are still superior to metoclopramide: they are both more efficacious and have better side effect profiles. But for this benefit there is a substantial cost that must be considered when choosing an anti-emetic – these drugs are around 20 times more expensive than metoclopramide in most markets. "Number needed to treat" when applied to large at-risk groups must also be balanced with our capacity to treat in a medical world with finite health budgets. 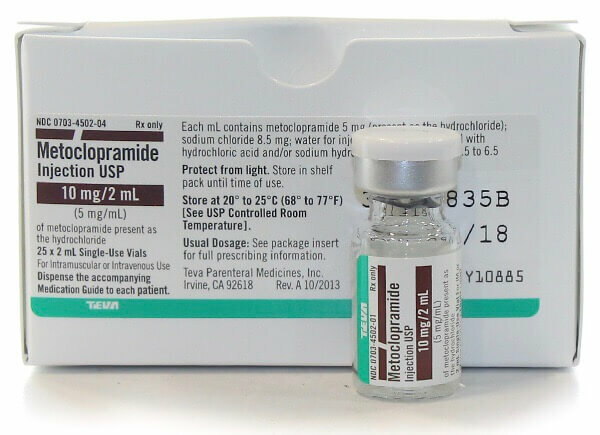 Metoclopramide – worthwhile after all? Many small, aged RCTs with imperfect methodology. Heterogenous surgical procedures and anesthetic techniques. Moderate number of studies over a long time period. Metoclopramide is almost universally available, very cheap and while newer antiemetics are better, still offers a favorable side effect profile. The use of metoclopromide in groups at high risk of IONV or PONV likely offers clinically significant benefit at low cost and very small risk.